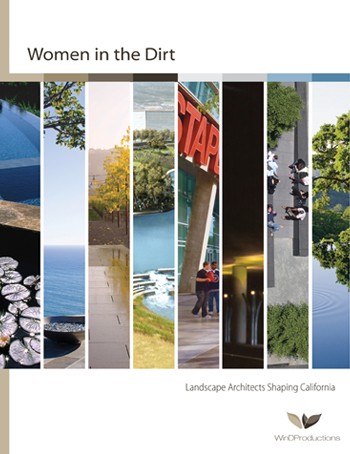 Women in the Dirt: Landscape Architects Shaping California is a documentary film based on interviews with seven of the most talented female designers in California today. 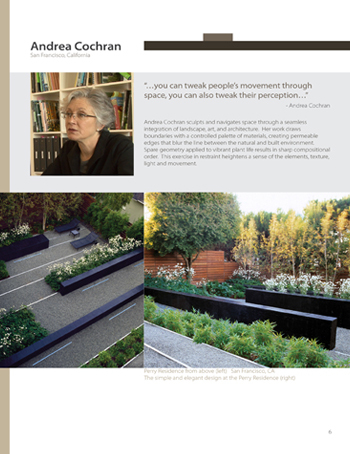 The purpose of the film is to promote the profession of landscape architecture while demonstrating the wide variety of work done by these women; from private gardens to large public projects, and political involvement resulting in changes of public policy, these women are shaping California. Seven of the most talented female designers in California will be introduced in this film. They are all award winning landscape architects with remarkable reputations. Examples of their work will show that beyond the squares of lawn and concrete in the suburban sprawl, a new landscape approach is being adopted. It is graceful, elegant and smart. When landscape designers create gardens that are beautiful, as well as sustainable, the result is a general sense of well-being for all those who experience such work. This film has three intended purposes. 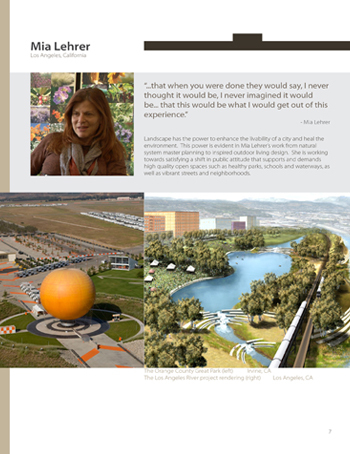 The first is to examine the role of women in landscape architecture in California; the second is to promote the profession of landscape architecture through film and to show design methods that are not only beautiful, but sustainable; the third is to educate the general public about alternatives in landscape design. The role of women in landscape architecture has changed many times throughout history, and in fact dates back to the 1800's. Women have gone back and forth between the forefront and the background of the profession. In California in particular, Beatrix Farrand (the only woman among 10 men who began the American Society of Landscape Architects), contributed a substantial amount of money to Berkeley's landscape architecture program making it the university with the largest endowment for that field in the country. Women have affected this profession in many different ways, though their contributions have not always been so widely accepted, or easily visible as they are today. 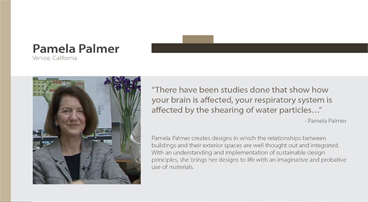 When it comes to explaining what a landscape architect does, nobody says it better than Peter Walker. "You take the land, and you take the things on it, and the spaces they form, and you rearrange them, and you make them healthy, efficient, beautiful, and that's your purpose. You are essentially dealing with all of those things, and the thing that makes them a little weird is that they are outdoors, and they are rained on, and snowed on, so you can't fix them the way you can fix a piece of architecture. And then the other side which is even more weird, and that is that things are growing... so you're trying to compose this stuff which is in-flight and you have to think about that, and to some extent abstract that, because you have to say okay, what's it going to look like when it's three(3) years old, what's it going to look like when it's five (5) years old, what's it going to look like when it's twenty-five (25) years old, what's it going to look like when it's fifty (50) years old." The California landscape comes with a history of man's intervention. People from all corners of the globe have moved to California bringing with them cultural traditions, food, agricultural methods, plant materials and landscape styles. This climate is vastly different from the rest of North America and the native plants have adapted to California's conditions. They blossom green with winter rains and conserve their energy by hunkering down for the long hot, dry season. Because of this, in the spring, California becomes a palette of color. The irony then becomes people, many moving from the East Coast with rainy summers wanting the plants and planting styles they were familiar with. They want green turf around their home, foundation plantings, bedding flowers and a specimen tree which completes the 'three piece suit' of residential landscape design. However, landscapes with indigenous plants and serene natural settings are becoming more popular. Areas designed with plants native to their location are more easily sustained and therefore are easier to enjoy. The seven women interviewed were chosen from a list of 22 women whose work was studied through books, magazine articles, awards and web sites. 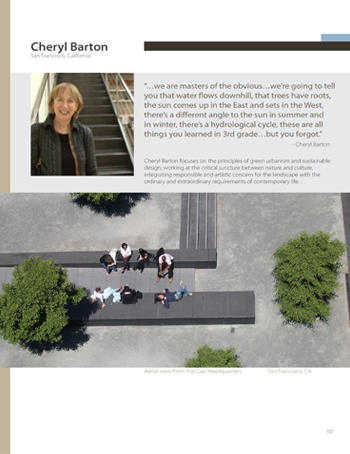 The women chosen were those with a significant body of work in California who have practiced in landscape architecture for 25-40 years. Their work was examined for its significant impact on private gardens, corporate properties, public parks, street improvements and master plans. Some of their work has been seen by the public because of magazine publications; however, this documentary is the first of its kind to bring their collective works to an audience. Letters of intent were written to nine women and seven accepted the invitation to be interviewed by this student group. After an in depth study of each woman's work and expertise, a list of questions was sent in advance of the film date. The women were interviewed in their offices and gardens. Each woman's office also provided still photography to supplement the video footage. This documentary is a unique approach to promote the profession. It is both interesting and visually stimulating. It was recorded with broadcast quality video and sound equipment and utilized modern editing techniques. It appeals to a wide range of knowledgeable professionals, homeowners and young students. 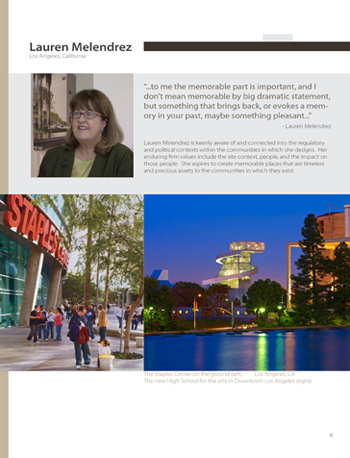 It not only showcases an extensive collection of works from experienced landscape designers, but it also highlights women's involvement in a growing field and has the potential of attracting prospective students to this major. It is filled with beautiful video and still photography that captures a wonderful variety of cultural landscape designs. The film highlights the amazingly unique shapes and colors of California, the compelling stories and works of these women and the distinctive ways they have affected the California landscapes. 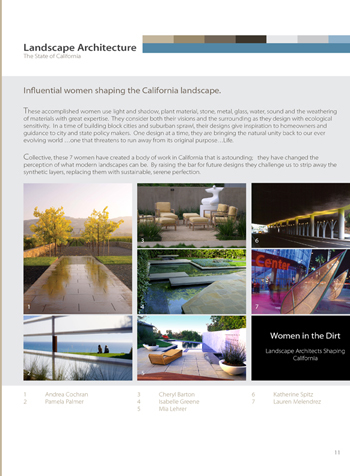 Women in the Dirt: Landscape Architects Shaping Californialeaves you with new found knowledge of the exceedingly natural approach these women are taking to create serene and calming spaces. This film's primary audience consists of students of architecture, landscape architecture, urban planning, art, horticulture, women's studies and professionals in those fields. Our extended audience will be the general public. It has already been screened several times to mixed audiences. We are hoping to distribute this to high schools, colleges and universities, and are also looking into showing the film at public forums like museums and arboretums. We will be creating a website where we will show the trailer of the film and make copies available. Ultimately our goal is to make it accessible to the general public through television. 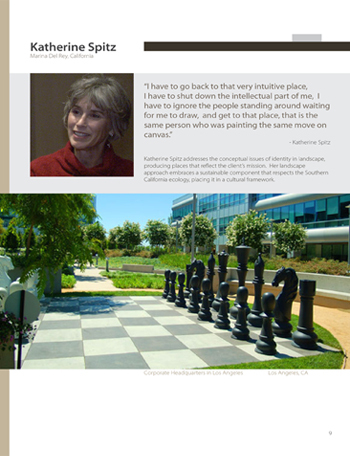 Principle of KSA- Katherine Spitz Associates, Inc.
Perry Residence from above (left) San Francisco, CA. The simple and elegant design at the Perry Residence (right). 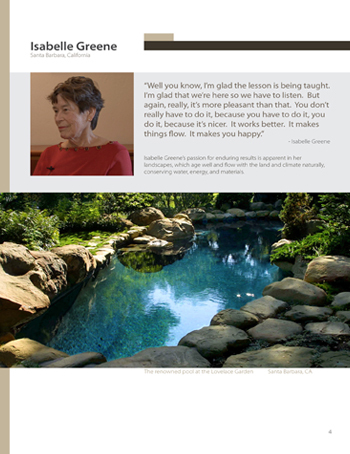 "A wonderful celebration of women’s achievements in landscape architecture on the West coast. The production values were good and it communicates clearly to any audience."